Last week Badger got a chance to leave the Sett and sit down with the Sky Sports F1 team at the rather swanky Royal Automobile Club in London’s glittering West End, a place that makes the Paddock Club look like a branch of McDonalds. Surrounded by all this opulance the conversation naturally turned to money and we asked Damon Hill, David Croft and Martin Brundle what they thought about the rise of ‘pay drivers’ in Formula One. BadgerGP – Talking about the back of the grid there seems to have been a move towards ‘pay drivers’ to a lesser or greater extent. How bad is that for the sport? Do you rate any of the people who are labelled as ‘pay drivers’ or is this a downward spiral for the end of the grid? Damon Hill – It does seem to me a little bit rough that if you are to compete in the sport you have to bring money into play. I think the problem is how you, if you we’re to try and do it differently, would legislate for that. Would you make it illegal for a driver to bring money to a team so the teams had to? A bit like football, employ drivers from a talent pool and they would compete to get the best drivers they could. How much would it cost to play for Man United? Maybe some footballers out there should think about that. They might be able to move themselves up from another division into the Premier League if they brought some money but that would be a crazy world. I think perhaps, when you look across the sports that are predominant in the world like golf, tennis and football it does seem that Formula 1 sticks out a little bit as a sport where somebody can be in a competitive situation by virtue of bringing some money to be there. Where does it stop? Would Ferrari for instance take a driver who brought 100 million dollars to their team, where is the price? David Croft – They do, he’s called Fernando Alonso. That Santander backing would not be there at Ferrari without Fernando Alonso. Martin Brundle – Barrichello and Lauda paid for their first runs. BadgerGP – Schumacher was backed by Mercedes. David Croft – And Senna too brought Nacional sponsorship. Martin Brundle – The money has to come from somewhere. BadgerGP – But is that not always lost in the shuffle of it all? People only remember the bad drivers and they are immediately labeled with the ‘pay driver’ tag? The ‘pay drivers’ of today are not billionaire playboys who have put money in for ride like they were in the mid 90’s. Whereas in the past it was people paying to sit in a seat, it’s now people being backed by companies to sit in a seat. Is it still affected by the stigma attached to the history of it? 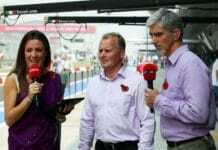 Damon Hill – When you look at it, eventually it comes out in the wash. If you are not good as a driver it will show up and you won’t stay there, it does not matter how much money you bring – you get found out. Pay drivers get a window of opportunity to show what they can do. If they have more talent than is suggested by the fact that they brought money then they will stay, it will become obvious. BadgerGP – Do you think there is still room for very talented drivers to get to Formula 1 without financial support? David Croft – That is the question, if you don’t have the budget, can you, if you are talented enough make your way to Formula 1? BadgerGP – Exactly. If you are the next Senna, you have that raw talent but you don’t necessarily have the funding behind you is there still a route to get there these days? Martin Brundle – I has changed, because a Dad and his lad and local businesses, an uncle and all that could get you on the ladder to get you recognised to get picked up. Unfortunately none of the money from the sport goes back into the grass roots, zero. It just goes straight to the top and that is the money that is missing – I think the landscape has changed, if you look at the 100 kids in F3, GP1, GP2, World Series by Renault and the chances in any of them. Unless you are funded by the richest man in the world, or the Venezuelan government, you better be as good as Lewis Hamilton or otherwise you are not going to get though. What do you think? Are ‘pay drivers’ running the sport or is sponsorship just an inevitable part of how Formula One works and has always worked? Tell us in the comments below. Next article2013 Season Predictions – Do You Agree?